Ingushetia today is quite clearly a republic at war. First of all, it has been declared a counter-terrorist operation zone – an ominous sign, given that both Chechen wars are still officially referred to as “counter-terrorist operations” by the Russian government. Secondly, additional divisions of army and security personnel have been moved to its territory. Finally, Ingushetia is the site of regularly occurring armed confrontations that result in the deaths not only of the actual participants, but also the civilian population, with unexpected disappearances becoming a widespread phenomenon. At the same time, the information coming out of the republic, as relayed by the Russian media, provides no clues as to the reality of the situation, with the truth being deliberately warped in order to the benefit the government. The main theories widely discussed in connection with the current situation in Ingushetia are tied to the so-called “Chechen trail” found in the republic. The “official theory” states that the hostilities in Ingushetia are organized by al-Qaeda terrorists with the help and direct participation of the Chechen separatist underground. The “semi-official theory” suggests that the current tensions are tied to Ramzan Kadyrov’s attempt to reunite Ingushetia and Chechnya. In light of the obvious helplessness of the Ingush leadership and the federal forces sent in as reinforcements, an appeal can be made to the experienced neighbor to the east, which has been successful in pacifying and stabilizing a problematic region. Such an outcome would uphold the image of a Vainakh and Muslim leader that Kadyrov has sought to cultivate. Another explanation used in the official declarations coming out of Magas and Moscow is the suggestion that the opposition is using these hostilities as a way of pressuring the Kremlin into removing [Ingushetia’s president Murat] Zyazikov from power. Unofficial explanations vary widely, and include the theory that recent events are a provocation staged by the security services in order to “discredit the Ingush nation and to physically liquidate Ingush youth.” A common notion holds that there is an “Ossetian trail” to be found behind the whole affair, showing just how much tension remains in Ossetian-Ingush relations even a decade after the swift, but bloody ethnic conflicts of 1992. Both of these ideas are widely discussed on Ingush internet forums. Today’s Ingushetia is undoubtedly a tangle of many different problems. In order to answer the question of what exactly is going on in the republic, however, it is necessary to properly sort out the conflicting sides. Who exactly is attacking non-Ingush civilians? Who is attacking members of the security services and the military? Are all those killed by the security services actually mujahideen? These are not easy questions to answer, since a wartime situation partially obscures the usually clear-cut moral differences between murder and a military operation. For example, the recent murders of non-Ingush persons looked like the handiwork of the guerrillas, since they had frequently stated that they would not tolerate the presence of “Russkies” in the Caucasus. But the murders have now expanded to encompass members of other ethnic groups, not just Russians, making the participation of the separatist underground far less likely. This is especially true after three officers of the Russian army were identified and arrested for the murder of a Russian family, but then later freed and transferred to another unit in Ossetia. The total lack of coverage of this incident by the Russian media clearly fits the information policy of the Kremlin. By making Russian society focus on the certainty that Ingush guerrillas are carrying out ethnic and religious cleansing, a solid rationale is provided for the military to begin mass repressions. Inside Ingushetia, however, the suspicion that Russian security services are responsible for non-Ingush murders has grown. Such ideas have been confirmed by the shooting death of an Ingush police officer immediately following the release of information regarding his investigation into the role of Russian military personnel in recent murders. When discussing the killings of Russian military personnel, as well as the killings of officials from the prosecutor’s office, the Ministry of Internal Affairs or the FSB, it is hard to be sure whether the guerrillas are to blame. Many so-called “death squads” – secret mobile groups from the FSB, Interior Ministry and GRU – disguise themselves as guerrillas when undertaking missions aimed at the physical destruction of persons suspected of assisting or sympathizing with the underground. Information about such groups is known only to a few high-ranking officials. Since Ingushetia is the zone of a counter-terrorist operation, there is a very high concentration of such groups from various jurisdictions. This makes it almost impossible to determine who – the guerrillas, the FSB, the GRU or the Interior Ministry – disposed of a particular individual. Everyone suspects everyone else, with confrontations between different governmental services a reality, since the insurgents are known to disguise themselves as security personnel. The Ossetian factor also cannot be ignored and is not simply a myth. Since the hostage crisis in Beslan, the disappearance of Ingush has become a mass phenomenon in the areas that border Ossetia. Ingush human rights activists maintain that an Ossetian group dedicated to vengeance, called the “Lesnyi bratia” (the “Forest brotherhood”), exists in the neighboring republic. It is purportedly made up of Ossetians from all social groups and even receives support from the government and the security apparatus of North Ossetia. On the other hand, the frequency and severity of the attacks on security personnel makes it hard to dispute that a powerful underground is actually present in Ingushetia. This raises questions about the resources that this underground possesses, how well organized it is and whether is has a unified leadership. When discussing who would be a member of such a resistance, it should be understood that given the current sustained crisis, almost any resident of the republic, regardless of his social or political status, has a reason to be dissatisfied with the local government. Ingushetia is the only region of Russia that does not have its own defined borders. The status of the “republic” is a fiction when paired with the lack of officially determined and established borders. The problem here is not only the Prigorodny district – that part of Ingushetia that Joseph Stalin transferred to Ossetia when the Ingush were deported to Central Asia. This territory, along with Ingush homes, remained part of Ossetia following the return of the Ingush to their homeland under Khrushchev. This unresolved issue sparked the bloodletting of the early 1990s and remains a source of tension to this day. But the Ingush have not only lost lands in the west, but significant territories are still in dispute with Chechnya in the east. The unending discussions about resurrecting a unified Chechen-Ingush republic also hint at the possibility of Ingushetia completely losing its independence. The views of the two sides are diametrically opposed, with public debates of the issue showing the categorical opposition of the Ingush and the lively interest of the Chechens. The loss of territory became especially painful in 2006, when the FSB gained control over the holiest land of the Ingush people, the Dzheirakh district, which lies in the 25-kilometer “border” area placed under the special control of the Russian border patrol. In this fashion, the territory of Ingushetia has shrunk notably, even though the republic has one of the largest population growth rates in the Russian Federation. In the Caucasus, the issue of territorial loss cannot be separated from the ideas of ethnic and political self-identification. The bad blood caused by the loss of lands contributes to the overall self-image of an ethnic group and also shapes its view of the neighboring republics and Russia as a whole, since the country seems to have given more rights and independence to other ethnic groups. The obvious weakness of President Murat Zyazikov, an FSB general with only a ten percent approval rating, a man that was forced down Ingushetia’s throat instead of the well-respected Rosalyn Aushev, has also negatively affected the situation. The persistent feeling that the government is unjust, and that this injustice continues regardless of any political changes, has brought Ingushetia to its current state. 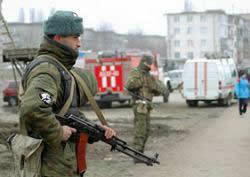 Despite the Kremlin’s claims, Russia does not face a small group of bandits financed by Arab emissaries in Ingushetia. Events suggest that the Ingush “underground” consists of almost the entire republic. The real underground, the actual guerrillas, suffered severe losses in 2005 and 2006. In 2005, Ilyes Gorchkhanov, the emir of Ingushetia, a man always in close contact with Shamil Basaev, was killed in Nalchik. In 2006, Basaev himself was killed, along with most of the Ingush insurgent leaders. The guerrillas were leaderless and confused, connections to other groups in the region were lost and no real centralization was possible. Despite these conditions, the resistance continued to fight, with disparate groups doing what they saw as their duty – blowing up military and police cars and carrying out as many attacks as they could. It was at this time that Moscow took a step that went unnoticed by the media and the analysts. In 2006, duplicates of all governmental agencies and security services were created within the republic. Simply put, alongside the Interior Ministry, FSB, and prosecutor’s office of Ingushetia, there exist replicas of these organization fully staffed by persons from outside the republic. The level of mistrust for Ingush institutions by the Russian government has reached an all-time high. It was this unique situation that led Ingush society to overcome its internal divisions and pushed members of the local government and the even the security apparatus to support the underground. Four separate instances of armed Ingush OMON or other comparable security organizations confronting federal forces in defense of the local population have been recorded in the past three months. After a peaceful demonstration was fired upon last week, the Kremlin declared that the Ingush crisis has been resolved. This declaration is, given everything discussed above, completely irresponsible. War cannot be “resolved” and Russia already has experience with such a “resolution” in Chechnya. While the Kremlin claimed that the Chechen resistance had been destroyed, war spread to the entirety of the North Caucasus. Fatima Tlisova is a National Security and Human Rights Fellow at the Carr Center for Human Rights Kennedy School of Government, Harvard University. She has worked for ten years as a correspondent for a number of independent Russian papers as wells and international media, including the Associated Press, "Novaya Gazeta", RFE/RL, BBC and has also served as chief of the North Caucasian bureau of the Russian news agency Regnum. Fatima is a regular writer for IWPR (London) and for the Jamestown Foundation (Washington DC). The author would like to thank her sources in Ingushetia and must maintain their anonymity in order to insure their safety. Materials from www.ingushetia.ru, www.gazeta.ru, www.gzt.ru, www.rutv.ru, www.kavkaz.memo.ru and the television station “Severnyi Kavkaz” have been used in writing this article.